While the nation's attention remains fixed on the NBA and the NFL, particularly regarding the ongoing protest movement started by Colin Kaepernick last year (and further fueled by Donald Trump's recent verbal attack on the matter), the conscious decision to take a stand by way of kneeling during the national anthem has officially spread to the MLB. 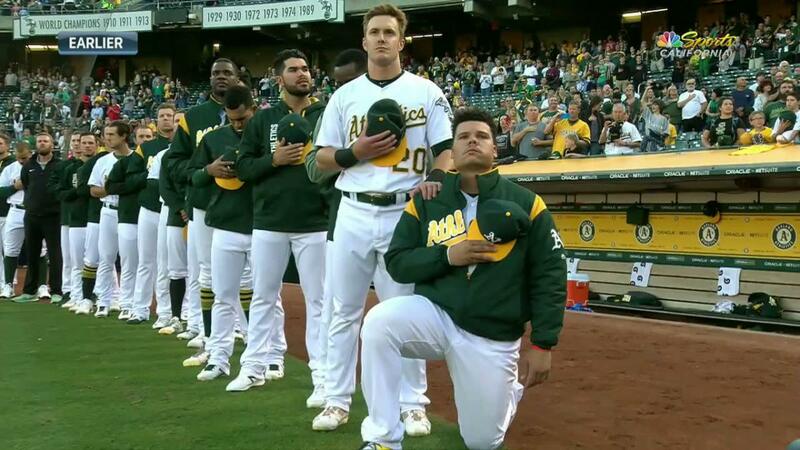 As reported, Bruce Maxwell, a catcher for the Oakland A's, has become the first major-league player to kneel during the national anthem. "My decision had been coming for a long time," Maxwell shared with the SF Chronicle, speaking of his choice to join the protest led by Kaepernick. "The only way we can come together is by informing. ... To single out NFL players for doing this isn't something we should be doing — I felt it should be a little more broad." Maxwell, who is the son of an Army Vet and was born on a military base, plans to continue kneeling for the anthem throughout the duration of the season. "The point of my kneeling was not to disrespect our military or our constitution or our country," Maxwell further explained. "My hand was over my heart because I love this country and I have family members, including my father, who bled for this country, and who continue to serve. At the end of the day, this is the best country on the planet. I am and forever will be an American citizen and grateful to be here, but my kneeling is what's getting the attention, and I'm kneeling for the people who don't have a voice." "This goes beyond the Black and Hispanic communities because right now we have a racial divide that's being practiced from the highest power we have in this country saying it's basically OK to treat people differently," he continued. "I'm kneeling for a cause but I'm in no way disrespecting my country or my flag." The A's have since issued a statement on Twitter reacting to their player's choice, writing, "The Oakland A's pride ourselves on being inclusive. We respect and support all our players' constitutional rights and freedom of expression." The MLB has also issued a statement, echoing a similar sentiment to that of the A's. Last year, Baltimore outfielder Adam Jones shared with USA Today that the protest hadn't spread to the MLB "because baseball is a white man's sport." As reported by USA Today, the percentage of African-Americans on Opening Day rosters was 7.1 in 2017, marking the lowest since 1958. This now has gone from just a BlackLives Matter topic to just complete inequality of any man or woman that wants to stand for Their rights! Inequality is being displayed bigger than ever right now as our president shows that freeedom of protest and speech is not allowed..